Thyme for Cooking's Main Courses: Scallops, Pork with Onions. Scallops are rich, sweet, and often expensive. But we can still indulge on occasion. 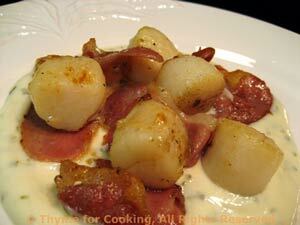 Here they are quickly seared with a bit of Prosciutto and served on a bed of velvety Tarragon Cream. Mix olive oil and paprika. Cut ham slices in thirds. Heat large nonstick skillet over medium-high heat . When hot add scallops and ham. 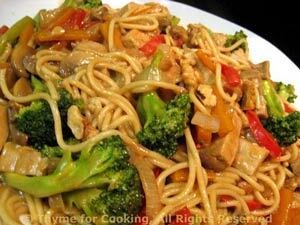 Stir-fry quickly until scallops turn opaque and ham starts to crisp. Remove and serve on Tarragon Cream. In a small saucepan, over medium heat, bring stock and wine to a boil. Add tarragon, basil and simmer 5 minutes. Remove from heat and stir in yogurt / crème fraiche. Note: Some scallops will release water when cooked, causing them to steam rather than fry. Be sure to use a large skillet, giving them plenty of room. Turn the heat to high after adding the scallops if they don't start to sizzle. I use a small loin roast, 1 1/2 lbs and it cooked to the correct temperature in just over an hour. 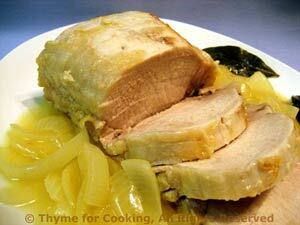 The bay leaves, mustard and wine add a lovely, slightly pungent flavor to both the pork and the Onion Sauce. Heat oil in a heavy pot or Dutch oven with tight-fitting lid. Add onions and sauté until tender, about 7 minutes. Move onions to the side and add pork. Brown on one side 5 minutes, then turn and brown the other. Stir the onions. Add bay leaves, wine, stock and mustard, turn heat to low, cover and braise for 1 hour. Take temperature, it should be 145F (62C). If not done, continue braising, checking temperature every 5 minutes. Increase heat under sauce. Add cornstarch and stir until thickened. Slice pork, spoon onions around and serve. This is based on a recipe from the cook book 'Risotto'. As always, the end result should be creamy, smooth, almost soup-like, never stiff. 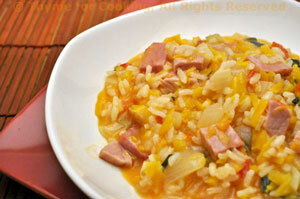 The squash gives a bit of sweetness to the risotto and adds to the overall velvety texture... and it's a lovely color! Peel butternut squash using potato/vegetable peeler. Cut it in half the long way (blossom to stem) and remove seeds. Using large holes on grater, shred part of the squash until you get 1 cup. Wrap the remainder in film and refrigerate. Add onion and tomato, sauté 5 minutes. Add squash and sauté 5 minutes longer. Before the last 1/3 cup taste a few kernels of rice. They should be just 'al dente' - slightly resistant to the tooth but fully cooked. If more stock is needed add it 2 tbs at a time and waiting until almost completely absorbed. At this point risotto will be thick but not stiff - there will still be visible liquid and it will not hold its shape on a plate. 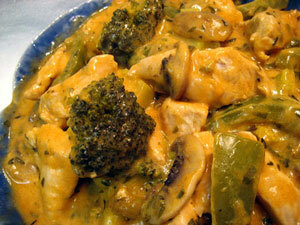 Add the Parmesan and the condimenti, stir well, pour into a bowl or risotto platter and serve immediately. It will continue to absorb liquid and the leftovers (if any) will be very stiff. Cut the ham into bite-size pieces. Heat olive oil in nonstick skillet. Add ham and sage and sauté until ham is lightly browned. Turn heat to very low and keep warm until needed. Note: The photo has a serving of steamed butternut squash on the side. Heat oil in a large nonstick skillet over medium-high heat. Add onions and quickly fry until very brown and starting to crisp. Add Worcestershire and stir well to combine. Return the skillet to medium-high heat. Divide the beef and make 2 loose patties, barely handling the meat. (I just cut the package in half). Add the beef and sauté, 2 - 5 minutes per side, depending on how you like it done. 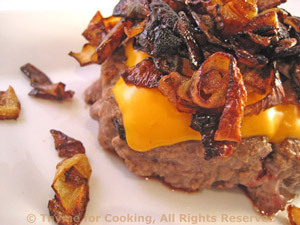 When ready, lay the sliced cheese on the beef, top with onions and cover until cheese melts.